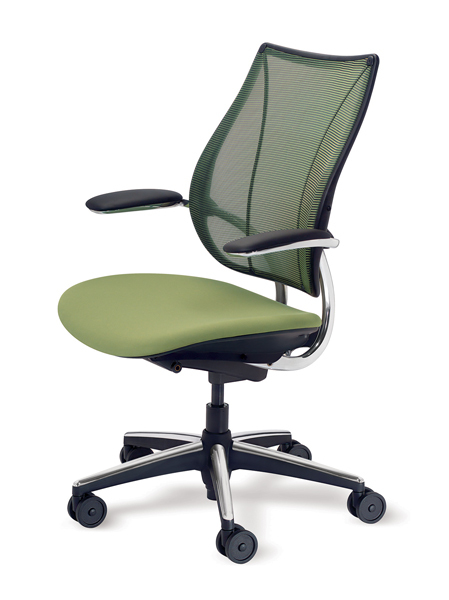 Back Care Basics is proud to offer this Quick Ship version of the ever popular Humanscale Liberty Chair. Vellum seat textiles in three fast ship colors coupled with three different mesh back colors and designs. Frames are done in Black with standard carpet casters, standard height cylinders with high quality standard foams. Out the door in one week guaranteed. Standard 3" heavy duty casters. Vellum Quick Ship seat fabrics. Monofilament mesh back in three popular colors. Arm height from seat 6.5-11.5"
Humanscale works hard to ensure that their environmental philosophy is reflected in each product they create. With their Design for Environment protocol, Humanscale designers and engineers examine the environmental impact of every choice made throughout the design process—from initial concept through final production. Recycled content: 16% post-consumer, 14% pre-consumer. Weighs as little as 40 pounds, minimizing resources used in shipping.